The Bakas were the earliest inhabitants of Cameroon. They live in the Congo rainforest but their homes are increasingly invaded by logging companies in search of less controlled areas to illegally harvest wood. Ropes tied on imposed sticks and thatched leaves are drenched with light mud particles as the light of the day shows up. The whole is developed into a tiny round house of 1.6M2. This is now the new home where Maka Daniel, 24 years old, his five weeks daughter and wife Paabo Odette, 14 years old, will live as from this day, Sunday, 23 August, 2015. “It took me seven days to build this our new home and two others for my grandparents.” Said Odette. She and her family have been migrating since she was three and since she got married at the age of nine, she has changed more than ten homes in search of a new shelter after their household is been invaded by a logging company with felling authorization from the government. About 105 timber companies exists in Cameroon. They export wood mostly to France, China and Lebanon. 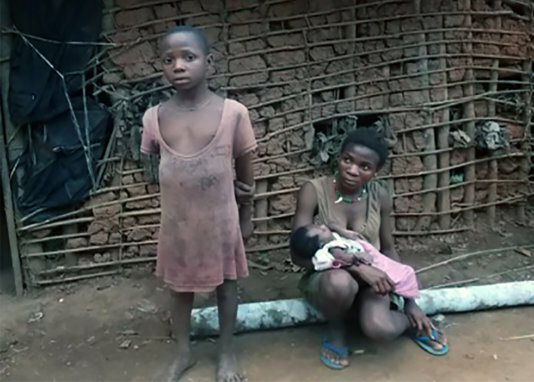 Their exploitation activities cause a lot of problems to the Bakas(Pigmies) living in the villages of Ngatou and Massea, on the high way that leads to Congro Brazzaville, some 750KM from Yaoundé in the Yokaduma sub-division of the Boumba and Ngoko Division of the East region of Cameroon. “They come with their big engines, destroy the forest and chase all the animals away. That is why we are constantly migrating. Some even cut trees on the nose of our houses. So we have to move,” Daniel laments. Consequently, “we find it difficult to hunt or harvest forest products. Even hunting now is done with a lot of precaution. WWF (World Wide Fund for Nature) warn us not to take any kind of animal from the forest. Our children are hungry,” says Njeng Tama, leader of the Baka community in Massea. For the Bakas and other forest communities, the forest represents everything to them. Food, agriculture, tradition and other rights are been performed in the forest. 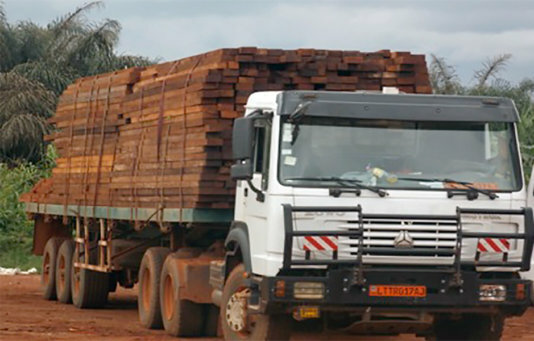 A report published in 2009 by the International Tropical Timber Organization (ITTO), tells us among the 105 industrial timber companies in Cameroon, 15 of them who harvest, process or/and export are illegal. Also, Cameroon suspended the extraction and processing licenses of some 72 industrial logging companies and has moved head on to punish some of the defaulters in 2013. But illegal logging is rapidly becoming popular, especially in small communities like this, where there is little surveillance. “We see a lot of logs pass here that does not respect the norms. Sometimes we keep them waiting for days sometimes we report them to the forces of law and order or call our administrative authorities”. Said Raymond, a forestry technician on the road between Makak and Lomie. However, Cameroon’s Minister of Forestry and Wildlife (MINFOF), Philip Ngole Ngwese continues to express the country’s commitment to fighting corruption and engaging local communities in forest management and exploitation of resources. In a joint declaration signed by the MINFOF boss and the European Union (EU) on the 10th of August, 2015, the government re-iterated their will to fight against illegal logging under the scheme of the Voluntary Partnership Agreement - “Forest Law Enforcement, Governance and Trade (FLEGT)” (APV FLEGT). Cameroon signed the FLEGT agreement with the EU in 2010 to help curb illegal logging and fight deforestation. 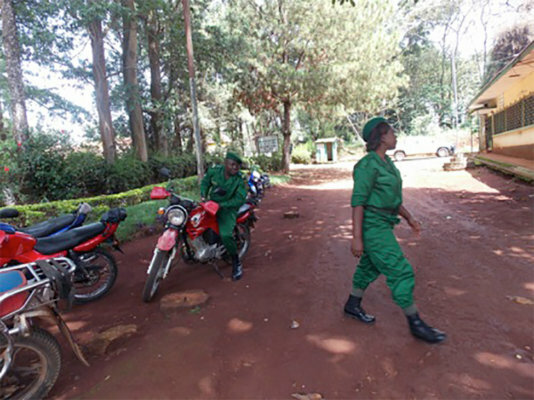 Although recent reports from Google and the University of Maryland tells us there is a decline in global forest loss (18.7 million hectares) of 9% compared to 2013 and 20% paralleled to 2012, NGOs participating at the 14th edition of the World Forestry Congress in Durban, South Africa, say Congo basin countries must fortify their efforts to fight illegal logging but equally called on their partners (Europe, Asia and America) to take solemn actions against this act which brings distressing effects to the nations. Paabo Odette, 14, junior sister, Denge and clan members endure the effects of logging as they migrate without stopping to get a better shelter and hunting grown in the rainforest. Because of strict regulation and surveillance in forest exploitation areas, loggers have changed strategy to illegally take wood out of the forest. They go right into the hinterlands cut prohibited species, saw into plank and mix with legal wood to transport to the city or better still traffic the illegal wood in cargo containers. Raymond and colleague are heading to their office in Abong Bang after controlling more than 300 trucks leaving the forest with wood on this day, Saturday, 22 August, 2015. Why is fighting climate change in Cameroon so difficult?